Last time we had a quick overview of the lyrics arrangement but the main interest in Two Of Us is the odd things happening to the rhythm and meter. Firstly the verse melody has an interesting shape. Melodies often have structure that repeats at the beginning - AAB (Can't Buy Me Love – verse) or ever other part ABAB (the verses of Help, We Can Work It Out) or ABAC (verse Here Comes The Sun). But Two Of Us melody repeats in the middle, and then adds an extra part on the end the second time around. This gives the song a catchy stuck record/hiccup feel. Interesting as that is, the chords are where it's all happening for me. We have a verse in G and (mostly) 4/4 but the chorus is (mostly) 3 / 4 and the bridge returns to 4/4 but is (mostly) in Bb major. So that's a time change (Ticket 15) AND a key change (Ticket 45) between section. 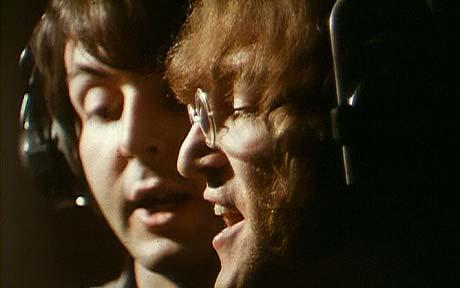 More than just simple time changes though, the verse and chorus time signatures keep switching in a way I've come to call the 'Lennon edit' (Ticket 37) where you basically cut any extra beat or bar that has no vocals (the end of every line of verse on All You Need Is Love is the prime example). I'm not saying there was originally something there that was cut, simply that Lennon often was impatient to get to the next line and had no desire to wait for the next 'correct' moment. After quite a boring transition where everything stops, leaving the drums to build up on their own, we slam into the new key. The bridge then goes from Bb major (Bb Dm Gm) to C major (Am) back to G major (via the D major chord that acts as a V chord). You could argue that the key of C major is really A minor, but as both the chord and melody at “farther than the” repeat almost exactly a tone higher for “road that stretches” it sounds like the key is rising. which is ticket 36 and the stop to emphasis the key word 'home' at the end of the chorus (Ticket 30). Next time we'll untangle the mystery of the Get Back track.